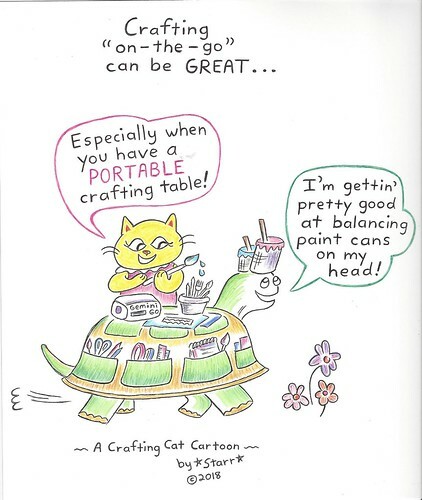 HSN Community / Forums / Crafts & Sewing / A New Cartoon, for Crafting Fans! A New Cartoon, for Crafting Fans! Oh WOW JollyJelly We LOVE this Cartoon too … No one can pick a Favorite! Smartypants favorite is still Mama Cat (Crafting Cat). Hey JollyJelly …. Cherie and Kids are wondering if Nicky B. would make a Turtle pin??? That would be WAY COOL … Thanks so much for the Cartoon it’s such a treat!! her, too! You guys have been very encouraging fans! pass the idea on to him! You never know. Have a great day! I’m so happy to see a cartoon from you! I was worried when you didn’t post on craft day . This cartoon is so very clever and adorable . Thanks! I hope all is well with you. about every two months or so…. with me! But I’ll have to pay more attention to their schedule. This reply was modified 7 months, 1 week ago by jollyjelly.